So while I was sitting on one of my bar stools by the kitchen reading Vogue the other day, I received an email regarding a unique opportunity with CSN. A little background on them - An online-based retailer, they started this company just with two employees, and soon grew to a staff of 400+! They carry a huge range of items, from cookware to toys, and much more. They have also become one of the top 3 online U.S retailers of home and office goods over the years. Well they have kindly sponsored me with this Thomas Paul Cotton Gauze Scarf in Swoop Aqua! (Which I frankly think is a piece of art in itself.) 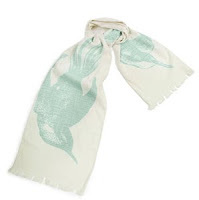 This scarf is 100% cotton, and has been beautifully hand-screened by the fabulous designer Thomas Paul. (He has even worked in major designer labels such as Calvin Klein, Bill Blass, and DKNY) So what are you waiting for? Let this scarf make its way into your closet! Tell me what you would wear with this. From clothes to accessories. I'd love to see what you come up with! Leave a comment with your name and email address on this entry. haha nice scarf.. ok i would wear that with denim jeans and a tee or a plain long sleeve just cause i like being in scrubs. it'll also look nice with a solid cardigan too. Your title reminds me of my favorite movie "You've Got Mail" with Meg Ryan and Tom Hanks :D It's such a good movie! Have you seen it? Yes I have! It's actually where I got it from :P and I love that movie as well !! Pretty! I have to leave in 15 minutes so will have to come back to this, but I just wanted to comment that I was a lil upset I couldn't read your font without my glasses lol so ollllld!! aww! that's a beautiful scarf; CSN has contacted me too and I got the cutest clutch wallet/ purse. so i won't be greedy i'll let someone else win :)! Awww thanks hun. and np :) it's ok, i wish i had more of those days. haha. sweats and hoodie over fully made up anyday LOL. i think this scarf would look great with a casual outfit also accessorized with a tuque that matches/compliments the scarf. i'm thinking of a kind of look that would be appropriate for the transition from Winter to Spring in Vancouver at this time. haha hope that makes sense. you'd better already have my e-mail address... but here it is again anyways. I'd love to wear this scarf with a white top, a gray long cardigan and sheer tights under shorts [both black]. As for accessories probably a silver heart pendant on a long chain. nice scarf ;))) nice blog HONEY! :D I LIKE IT!!! Well I'm going to enter! So i'll enter too =) it's a really pretty scarf and i have some ideas that maynt be very scarf-like but haha, in the summer i would actually wear it around one of my wrists sometime, of course tied in a fashionable way or something. Or as a 'belt' around my jeans. I like the 'trailing' effect haha.